One hundred years ago, the opening of the Los Angeles Aqueduct gave birth to our modern metropolis while forever constraining the destiny of the rural communities near the water’s source in the Owens Valley. In contemporary Los Angeles, we express our collective guilt by referring to the 233-mile engineering marvel as our “original sin.” But vague expressions of guilt have done little to assuage the anger in the Owens Valley—an anger that has often boiled over into violence. Peace prevailed over the first decade following the aqueduct’s 1913 completion. But when a thirsty Los Angeles started pumping groundwater from beneath the valley floor in 1923, the city’s secret land deals and legal maneuverings encouraged a culture of mistrust among Owens Valley residents. On May 21, 1924, local farmers dynamited the Alabama Gates, a part of the aqueduct near Lone Pine where operators could divert water in case of an overflow. Six months after the bombing, dozens of valley residents occupied the gates, opening the emergency spillway and thus diverting Los Angeles’ water supply into the parched bed of the Owens Lake. Your Guide To Water in L.A. The violence continued for several years. 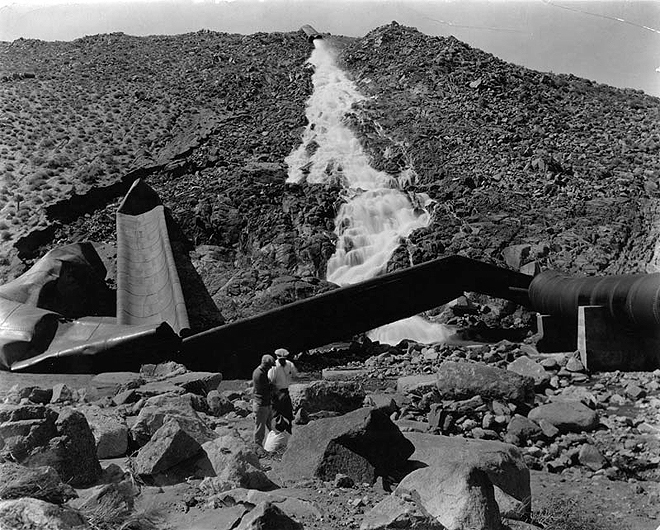 Over the course of two months in 1927, at least seven documented cases of sabotage shook the aqueduct. In one instance, boxes of dynamite exploded inside the pressurized pipe of the No Name Canyon Siphon, causing it to burst. In another, saboteurs exploded a hillside bomb in an attempt to bury the aqueduct beneath a landslide. Tensions eventually abated, but violence erupted again decades later in 1976, after Los Angeles announced plans to increase its groundwater pumping. On September 15, the Alabama Gates were bombed yet again, and the following day an unidentified archer launched an arrow—strapped to a stick of dynamite—into the Mulholland Memorial Fountain in Los Feliz. It failed to detonate. Miraculously, these so-called water wars ended without a single fatality. Above: The No Name Canyon Siphon after a dynamite attack in May 1927. Courtesy of the Herald-Examiner Collection, Los Angeles Public Library.